As I write this, it’s raining outside. Through the window I can see the tide rolling in and my freezing cold self is warming up by the giant wood stove in the middle of the cottage. It’s so darn cozy in here, I barely know what to do with myself. Oh, and the sheets in our bedrooms are made of fleece!!! They are by a company called Brunswick that only ships to Canada, but I will find these sheets somehow, or die trying. Today was…interesting. We are out in the middle of nowhere on gorgeous Point Prim and we decided to head up the Points East Coastal Route to see what else this side of the island has to offer. We discovered that it is definitely more remote over here. The largest town, Montague, has a couple of restaurants, but what we’ve discovered over the course of the past several days here is that when you ask a local for recommendations on where to go in other parts of the island, they have a hard time coming up with an answer. It seems, from an outsider’s perspective, that many people stay in the town where they live and don’t venture out too much. Just the other day we asked a shop owner for a recommendation of a place to get tea or coffee, and she was wracking her brain and had no idea what to tell us except for a Tim Horton’s in a town pretty far away. When we turned out of the road her shop was on, we ran into a TEA ROOM, a bloomin’ tea room, not half a mile from her shop. I mean…what? So today the only actual suggestion we got was to head to Souris (pronounced sawree) where the singing sands beach is located. Souris is actually a pretty cute town. We stopped at the beach there and walked out into the sea while the tide was low. The tides here are blowing our minds. When the tide is low you can walk like half a mile out, but when they start coming in, you’d better be near the shore because it happens pretty quickly. 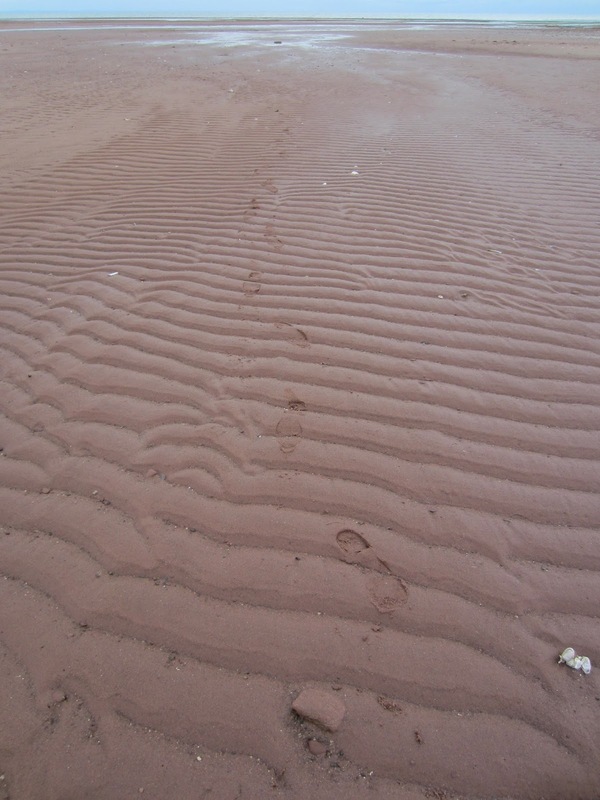 Turns out the singing sands at Basin Head Provincial Park just sound like squishing, squeaking sand when you step on it. While the sand serenaded us, we found sea glass and got to pet a giant Newfoundland dog who was the softest, cuddliest big guy ever. 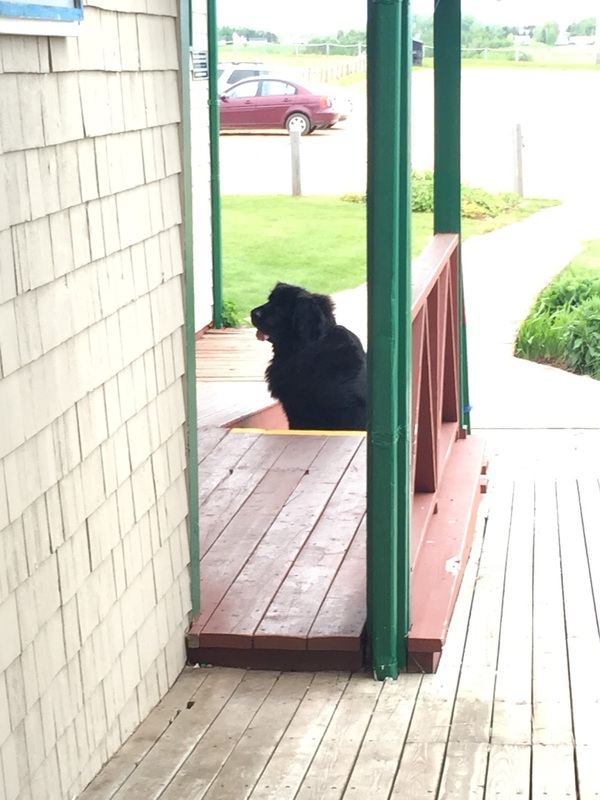 We were so excited to see him because we learned the other day that the rum runners always had Newfoundlands on their boats with them, obviously so they could have a good snuggle after a long day of illegal activity. After that, we took our frozen bodies back down to Souris where we stopped at a bakery and cleaned the place out. Cinnamon rolls have been a very important source of protein for us. There is an embarrassing amount of baked goods on our kitchen counter right now. I can’t even take a picture because you would think it was a Y2K situation up in here with us hoarding sweets for when the world ends. We decided to eat dinner at the Point Prim Chowder House tonight which has a great reputation all over the island for having the best seafood. Since I don’t eat seafood, I’ve been encouraging Ashley to eat lots of lobster so all this goodness doesn’t go to waste. I had a pulled pork grilled cheese and it was ridiculously delish. Only thing is that it’s unusually cold for this time of year and the place has no heat. Oh well, our hands were warmed by the food! 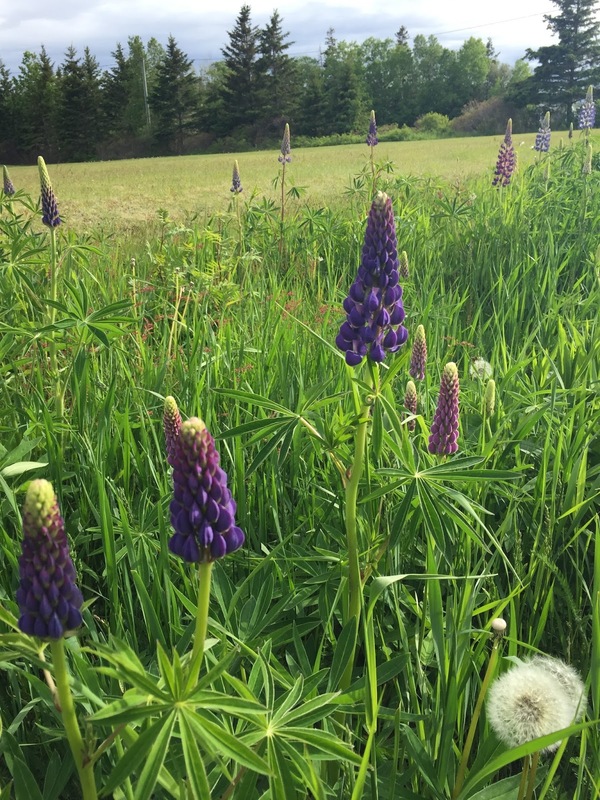 The lupines are in bloom all over the island. The roads and fields are lined with purples and pinks and it looks like a dream. When we got back to the cottage tonight, I walked out into the Northumberland Strait just because I could. I mean, look at this! The cottage owner helped us light the wood stove and we learned that he used to work on the ferry out of Wood Island for 39 years! In fact, when he found out I was from Long Island, he said that PEI sold their old ferry to New London, CT because it was too small and that is now the ferry they operate out of Orient Point. He’d been to that part of the island and said the people were very nice there. What a small world!!! He also gave us a local nugget, that just down the way you can take a dirt road down to the beach, walk to the left about 20 minutes until you hit a cove, and that’s where the seals hang out. (!!!!) So as soon as he left we jumped in the car and headed down the road just as it was starting to drizzle. We pressed on over the rocky shoreline, that looks like no other shore I’ve ever been on, keeping an eye on the tide. As we got closer to the cove, it looked like there might be something and then we started to see movement and little heads popping out of the water. It was magical. We actually were able to get relatively close and hear them honking their heads off in the water. These pics are a little grainy because I had my zoom all the way out and it was raining (look on the right side of the rock), but the experience was like something out of a dream, standing there in the misty rain on a red clay beach, watching these seals frolic in the gray ocean. We’ve pretty much covered the east side of the island today and we have several more days here. We absolutely loved the central coast and can’t get Rustico out of our minds, so we’re planning to head back there tomorrow and stop at all the little places we passed, but never went to. We might even do the Green Gables Heritage Place again because we loved it so much. Having this amount of time here has been really great because we don’t feel rushed and it’s nice to know we can drive for hours if we need to and still feel refreshed from the scenery. I never want to leave.